It certainly seems to be taking over. 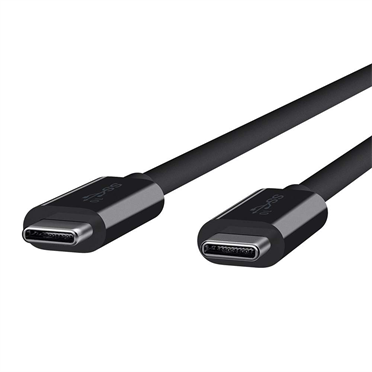 In the two years since we first learned about USB C, or “USB 3.1 with Type C Connector” as it is properly called, it’s started to take over the PC and mobile landscape. As well it should… USB C combines the speed of the SuperSpeed USB 3.0 standard with a MicroUSB-sized connector that’s completely reversible so that you can’t put it in wrong. It can carry enough power to run a computer, too. In a lot of ways, it’s the USB we always wanted. USB C is showing up everywhere. It’s on the latest laptops from Apple, Dell, and others — Apple is doubling down on the technology, removing almost all other ports from its new laptops. It’s on the latest cell phones, and while its design is still inferior to Apple’s Lightning connector it’s a far sight better than MicroUSB. Pretty much anything is. But will it be the last connector you’ll ever need? Ever? Not quite. USB-C can do a lot. It can carry more power than pretty much any laptop could need. It can transfer data as fast as any hard drive can take it. It’s slim and handsome and won’t snag other cables as you fish it through the mess behind your desk. But it’s not perfect. The one thing that USB-C fails at is video. Despite the fact that there’s enough bandwidth, there’s no standard for video over USB-C. If you want video, you’ll need an HDMI adapter, which is really a separate graphics card that connects to your computer over USB. Apple prefers the Thunderbolt 3 standard, which uses the same plug as USB-C (the same port can be a Thunderbolt 3 port or USB-C port depending on what’s plugged in) and Thunderbolt 3 can carry graphics. That’s great, but no one else is doing that. Thunderbolt is a decent standard and it’s great that you can use the same plug, but if you’re out of the Apple ecosphere, forget about it. Yet, I think this is a temporary setback. I think USB-C is the most significant change to computer connectivity since the original USB 1.0 in the 1990s. Before USB, you needed huge cables with tons of easily-broken pins to connect to things, and you also had to learn arcane ways of connecting and configuring ports. Apple products and PC products never used the same ports (ever!) and there really weren’t even good adapters to go from one to the other. All of a sudden, along came USB which could be used for keyboards, miceprinters, modems… all those things we cared about so much then. You could even add ports by just using a hub which was awesome. The world moved to USB pretty fast, because it was just that good. By the standards of the day it was small and easy to connect. Of course we’re more demanding and lazy now, which is why we need things to be even smaller and easier to connect. USB-C obliges. If you’re not quite ready to move over to USB-C but your computer is, you can still get adapters like this one which let you convert USB-C to its older cousin, letting you use all those old cables. There’s very little sacrifice in speed and your USB cables will work with your new device. For the best in USB-C accessories, shop Solid Signal now!